A generative/interactive computer music system inside a virtual reality environment, inside a physical installation. The audio in the room is produced by a multi-channel computer generated system. It is played over loudspeakers so that it is audible throughout the room. The sounds produced by the system also influence the light environment within the physical installation. 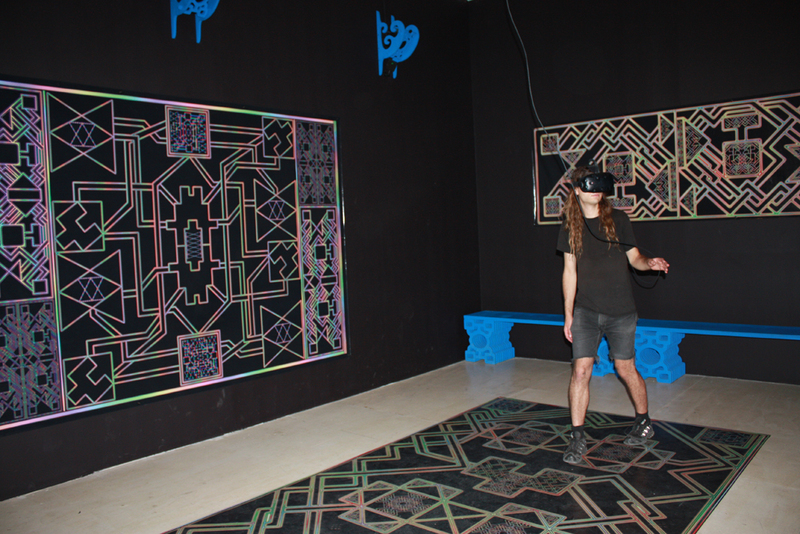 The VR user traverses a virtual environment that is overlaid on the physical one, which is marked by a custom printed vinyl floor tapestry. By walking through specific areas in the virtual and physical space, the VR user triggers randomizations in all the parameters affecting generative sound element corresponding with that area. Through this interaction, the VR user performs the cybernetic musical composition while the other visitors in the room become an audience to the shifting sonic architecture of the installation. The tapestries on the walls and floor are formalized flow charts that act as graphic scores for the generative musical system. The shapes in these diagrams each represent functional elements in the system such as the VR user, spatial triggers, sound producing units, and the speakers, while the lines connecting them represent causal relationships and signal flow.